The holy island of Iona, the most historic of Scotland's inner Hebrides, was the burial place of local and national kings from the early Christian period through the Middle Ages. It is most famous for its Abbey, restored this century and still a site of great power and a timeless atmosphere of sacred space. However little mention is ever made of the ceremonial routeway which weaves past it from the eastern shore to the Graveyard of the Kings. 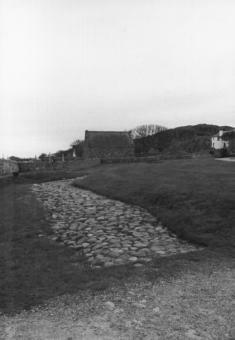 This cobbled path has acquired the name of 'Street of the Dead' and can be followed by visitors for much of its length although a wall now blocks its final entry into the graveyard where it ran up to a long mound. Along this path the body of the king was carried and lain upon the mound whilst a service took place in the adjacent chapel. After this the burial would take place. The sinuous nature of the path, the avoidance of the Abbey church, and the involvement of the mound are all features which add considerable interest to our search for patterns in paths of the dead.